Somalia generally has an arid to semi-arid climate. Rainfall is the defining characteristic of the climate and has a great spatial and temporal variability. 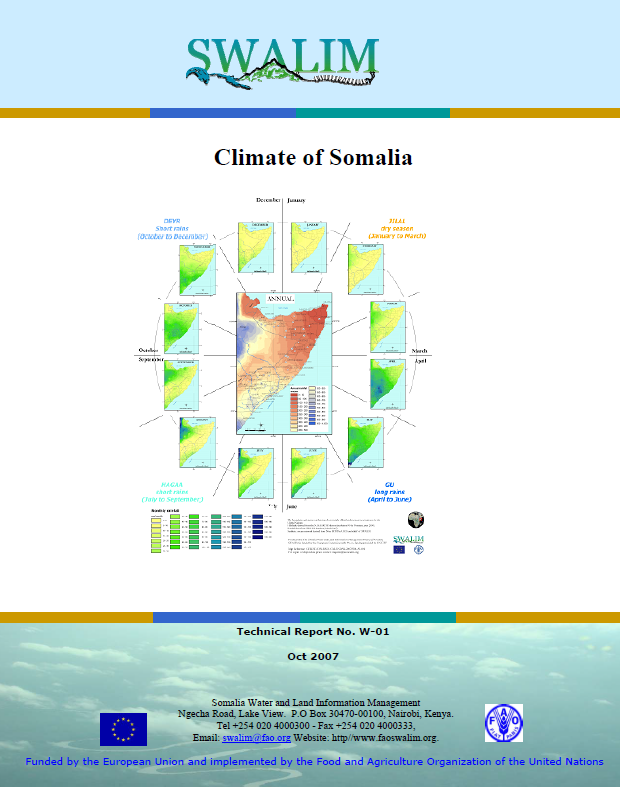 The climate of Somalia is determined by the north and south movement of the inter-Tropical Convergence Zone (ITCZ). In most areas of Somalia this results in two rainfall seasons - the Gu as the zone passes northwards and the Deyr as it moves south. In both cases, rain is produced from the moist air derived from the Indian Ocean, in the southerly air stream. The north-easterly winds, emanating from Asia and Arabia, produce little significant rain. It is generally considered that rainfall is the most important meteorological element affecting life in Somalia. In particular, variation from season to season, and variations within the season are what determine the successes of agricultural activities.